Although a large focus has been placed on external threats such as Ransomware, businesses are also at risk from internal threats. Employees have access to immense amounts of company data daily, and often organisations are not able to track what employees are accessing and what they are doing with company data. Without proper security in place employees can be the organisation’s biggest threat, as was the case with now infamous Edward Snowden and Bradley Manning. Snowden, stole and published classified NSA documents, and Manning, formerly a US army soldier disclosed confidential military and diplomatic documents to WikiLeaks. Organisations need to be aware of, and manage such internal threats, in addition to the ever present external threats as such Ransomware and APT’s. Managing the actions of all employees is a mammoth task whether the organisation has 10 or 10 000 employees. Businesses need to leverage new technology to reduce this burden, technology such as Panda Security’s new Advanced Reporting Tool. This efficient and easy-to-use tool analyses data to gain insight into corporate resource usage in order to make informed strategic decisions. ART automatically generates security intelligence allowing businesses to take control of all your endpoints and combat poor internal practices. Advanced Reporting Tool (ART) is an add-on for Panda’s Endpoint Detection and Response solution, Adaptive Defense, and enables information about all the processes running, gathered by Adaptive Defense, to be extracted, stored and correlated by ART. The platform automatically generates security intelligence and allows users to identify risky behaviours or problems – ultimately exposing any misuse of the corporate network or resources. Search relevant information. Increasing efficiencies by enabling IT staff to find any problem areas. Pinpoint problems by extracting behaviour patterns from resources and users, as well as identifying its impact on the business. Real-time alerts about any possible data breaches. 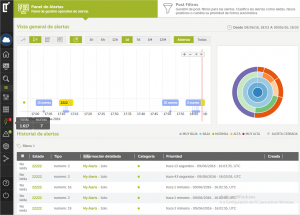 Advanced Reporting Tool – a real-time diagnosis tool that enables full visibility of the network. Information about IT security incidents. ART generates security intelligence then processes and associates those events as intrusion attempts. Controls network applications and resources. Controls access to business data. Displays file access with confidential information and its online traffic. The SIEMFeeder platform enables businesses to take advantage of Big Data and maximise resources. Many organisations are taking further steps to ensure they are protected from threats by implementing a SIEM solution. As an alternative or compliment to the Advanced Reporting Tool, Panda Security has developed SIEMFeeder – an add-on that enables communication between Adaptive Defense and users’ existing SIEM tool. SIEMFeeder provides relevant data, amplifies information and associates it with the information you already have, enabling detection of risk areas before they become the biggest threat to your business.